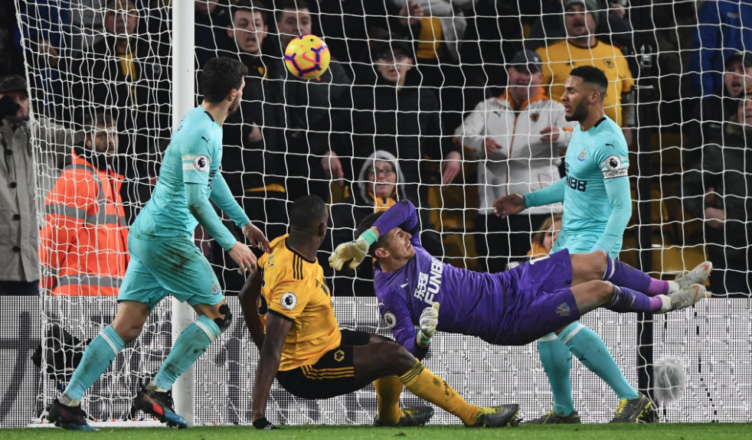 Wolves 1-1 Newcastle: Sickening late leveller spoils perfect away performance – NUFC blog – Newcastle United blog – NUFC Fixtures, News and Forum. What an absolute sickener – and not for the first time again this season. It’s hard to know where to start here. Firstly, it must be said that Dubravka needs to do better – punch that cross and we win the game – but A) the goal is scored on 94:45 (with 4 minutes added on) and B) there’s a valid argument that Boly’s arms are totally obstructing Dubravka. It’s devastating, spoiling what would’ve been an absolutely massive and well deserved win, but it’s fair to say we would’ve taken a point before the game – a small consolation at this stage. It’s easy to focus on the late drama and controversy, but we MUST praise the performance overall. We frustrated them, weathered storms, took our big chance at one end and defended superbly at the other. Longstaff was outstanding again, looking the most calm and classy player on the pitch at times, Lascelles was an absolute rock at the back, Hayden put in another commendable display, Perez and Rondon combined well and, up until his late error, Dubravka didn’t put a foot wrong. Almiron came on for the final 20 minutes and showed real promise. He showed real pace, looked very direct and was all action at both ends, seeming like he’s in good shape to start against Huddersfield in 12 days time. A tough one to stomach, but there’s plenty positives to take from this one. If we can compete like that between now and the end of the season we’ll be fine. PLAYER RATINGS: Wolves 1-1 Newcastle – One impressive 8, several 7’s, the odd 6 & two 5’s..
Sorensen didn’t even make the bench for Blackpool today. Injured? Being recalled to NUFC?Roberts came off the bench in the 78th minute for Cheltenham. DT: Blackpool were put into administration last week. Their Chairman had been doing some dodgy things with their finances and a high court ousted him, I think. I haven’t looked at it fully but they look to be in a mess. I think it would be best of we recalled the kid if we can. I think the guy’s name is Oyston and he looks a very strange dude. The picture I saw of him which the papers seem to use a lot he had a bright blue fedora hat and orange tie. I wonder if anyone in the British press during their w@nking off next week about the class of ’92 and the treble will mention that Bayern battered Man U for 89 minutes in probably the most one sided final in history? The result is the result, but don’t tell me it was deserved. Keano will probably have special memories and he didn’t even play in it. Soljkaer as manager GUARANTEES that the British press will see that game in a totally different light to the way it was. Lucky Man U. Bayern should have won by 5. Sorry if I wasn’t clear. Even though it is Liverpool/Bayern and both have more storied European history than Man U, it will all come back to 1999 as far as the press is concerned. Man City beat Chelsea 6 mil and the main story in The DailyHate Mail the next day is a picture of Pogba arriving at the Man U training ground. Olly: I don’t think that Rafa will bring in Diame immediately. What he does is swap things around in the first half of the season to keep players fit but then after the turn of the year he will stick with a team that is doing well. I think he will therefore stick with the same formation and keep Hayden and Longstaff. Diame or Ki will be there after 70 minutes. I wish he would make a change after 60 minutes sometimes, but that is not Rafa. He waits until 70+ mins unless there is an injury. The only change I can see is Almiron. We need someone more dynamic as a winger or number 10 and Atsu and Kenedy have been left wanting. Atsu less so than Kenedy but all you have to do is to look at their goals and assists to know there is still something missing. If I can see it, then a 2 time La Liga and Champions’ League winning manager can also see it. So – AMIRON FOR ATSU AND THAT IS IT. Don’t even mention Darlow for Dubravka because that isn’t happening. We are doing well given the fixtures. Beating City. We should probably have had a point from Spurs and 3 from Wolves. But still, 4 points from those games is OK. To stay up we need a point a game and we did better than that against 2-3-7. Pardew used to leave making subs until the 70th minute. I never agreed with that and likewise I don’t like Rafa doing it. If someone is having a poor game sub them even if it is early in the first half. Certainly would keep the players on their toes. At the moment players know they are not going to be subbed until at least the 70th minute. And why does Rafa persist with Kenedy? Stop the Presses. Wor Lee has an EXCLUSIVE that Rafa might sell 5 players if he stays. And who are they pray tell, oh wise and intrepid Chronicle reporter. What is this scoop you have for us that you dug up whilst NOT drinking sangria in Spain? Is it by chance 3 loanees, a 4th choice keeper and Joselu? Slow week, but that is really pushing it for a story. 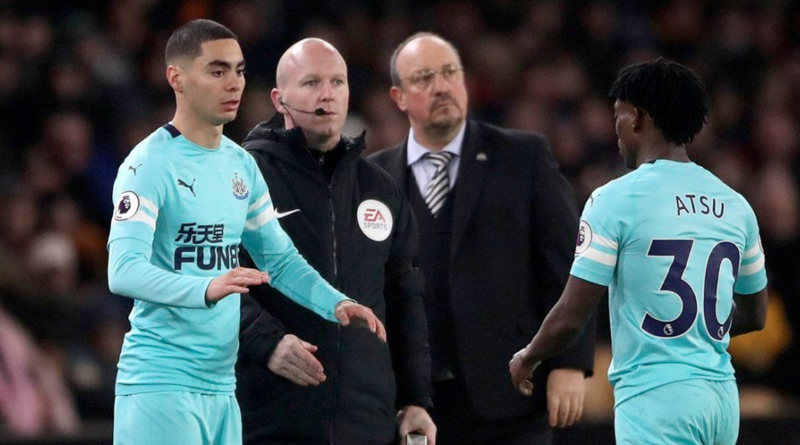 Groucho – Rafa has seen, as have we that Kenedy does have quality so he must be hoping he lays himself back into form. Have to admit it doesn’t look like it to me. It’s weird to see how he’s gone from very good to useless. Georgio I agree that last season Kenedy was good but I have yet to see him have a reasonable game this season never mind good . I have seen no improvement recently. How long do we wait? Rafa has shown a patience with Kenedy that he has not shown to some others. Does Kenedy speak Spanish? Have we been bought yet ? I am still worried about us getting complacent about Huddersfield. We are NUFC after all! I think when Derby went down with the lowest points total in PL history they did the double over us. I am not sure, but I think they did. Eric, aye, agree about Hudders, gonna be a tough old slog i think and i’m sure Mooy is back for them too. Kimtoon: no matter what, I want us to beat Huddersfield. I will gain no satisfaction from saying we should have been more vigilant if we draw or get beat. We absolutely have to beat Huddersfield and Burnley and then I can start to enjoy our football again. Because, I haven’t enjoyed our football much this year at all. Eric, i don’t think there’s been much to get bums off seats for a few years now, Ash has turned the club into a soul less entity where ‘ getting by ‘ is our new agenda. I’m getting to the point of what’s the point of nufc as things stand, devoid of ambition, going to rack and ruin insofar as the facilities are concerned. Every person in sport, be it an individual or a team sets out each campaign to win something. Given the PL title is way beyond us, that leaves the cups or top 6 finish, but the truth is there is no desire for even that now. It’s bloody shameful how we have slipped back and it could so easily be rectified if the will was there. Trouble is Eric we have history in not winning must win games. Aston Villa away ring any bells? Then just last season WBA who were already relegated came to SJP and won. Fulham, Brighton this season. I will make a prediction. That this Almiron lad will be very good. I have watched him and I know there is a difference between leagues, but he has talent. I know I might be known on here for slagging the odd player off (Rooney) but I can spot a good one when I see them. And Wazza was great until he was 27, it was just that his Pals couldn’t see when he had reached his sell-by-date. i don’t think Rondon is worth more than Gayle. He’s not exactly quick and he won’t be any faster next season. Tell West Brom to get lost at the price they are asking. Two quick players like Gayle and Almiron up front might be a good combination. We tend to be slow at present and where as I wouldn’t write Rondon off because he has had some good games for us, I do not accept the West Brom valuation. In case anybody thinks I only complain about commentators, journalists and pundits. We have Clive Allen on here now talking about Juve and he is brilliant. The fckin worst co-commentator is the tw@t Phil Neville. Prem. id go with that. He gives the moronic answers but there is no space for rebuttal from the questioner. Q: Where has the TV money gone? A: Ah Divvent knaa like, next question. Q: Should we buy Kenedy? A: Not for 30 million. Q: Should we start Almiron on Saturday? A: Yes. But if you had listened to me you would have known the deal was dead 2 hours before he got on the plane to sign the contract. Q: And what about Dubravka? A: Mark Douglas already answered this blaming the print staff for a stupid headline and absolving us here at Chronic Live of all responsibility for the moronic statements therein. And if you can’t be bothered to read Mark Douglas’s explanation of why The Chronic said that Dubravka should be dropped, it goes like this: The online staff are different to the print staff and headlines mean different things in print to what they mean online. WHAT!!! Can I have some of those magic beans you are selling or that timeshare in Tenerife? Simple as this. If we win our next to matches we will be playing PL football next season. Unfortuntely, it’s NUFC so I imagine we will probably draw tomorrow.